On June 28, 2007, Carl Landry was drafted as the 31st overall pick in the 2007 NBA Draft by the Seattle SuperSonics with the 1st pick in the 2nd round. His agent helped with his trade to the Houston Rockets for a future second round pick. Landry sat out 33 of the first 36 regular season games of his rookie season. Later in the season he got quality playing time and stepped up for the Rockets with a 63 FG%, while helping fill in for injured NBA All Star teammate, Yao Ming. He became a key role player for the Rockets' 22 game winning streak, the third longest in NBA history. He was named to the NBA All-Rookie Second Team. 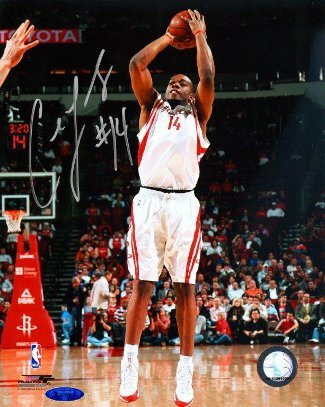 Carl Landry has hand signed this Houston Rockets 8x10 Photo. Tri-Star Hologram and Certificate of Authenticity from Athlon Sports.